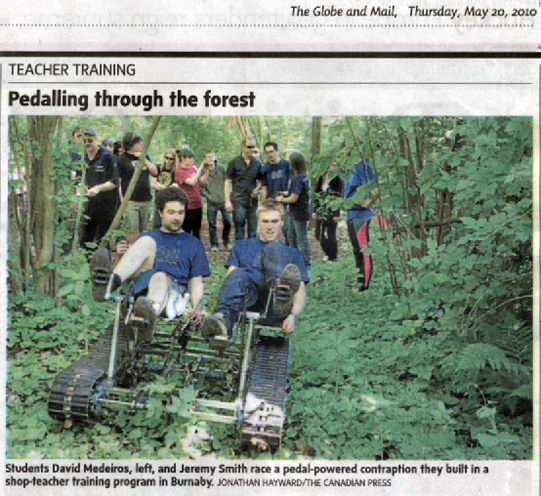 It seems Mr. Jeremy Spillane has built the real deal -- an actual pedal powered version of a Caterpillar Bulldozer. Well done, sir. Posted on this site is an un-referenced track design. Looks to have a contiunous rubber track cast specially for this purpose. 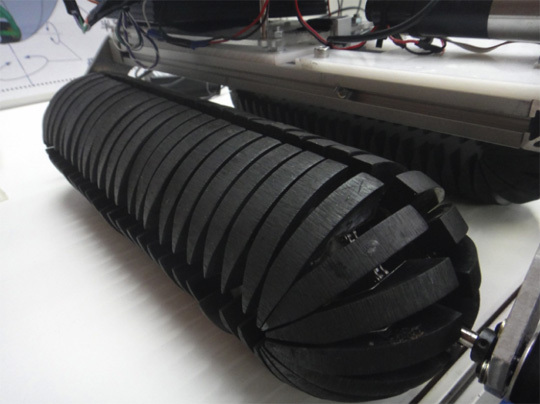 Advanced tread design will aid in self-cleaning mud and debris from clogging the tread pattern. Double leaf spring suspension on the bogies, slanted bogie positioning to aid track alignment and position, advanced cast wheels are likely plastic or aluminum for weight savings. Despite these high-tech seeming elements, others indicate it is dated. leaf springs are now typically replaced by coil springs and cylindrical shock absorbers, and the body of the vehicle seems to be made of wood beams and steel banding which has been replaced with all metal or composite construction techniques. Still, the track design itself fascinates. 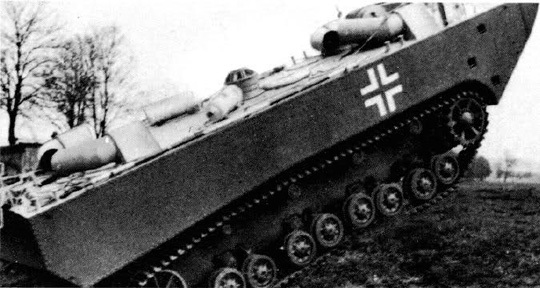 From the Germans during WWII: Panzerfahre Gepanzerte Landwasserschleppen. This tracked boat claimed to carry 20 people plus 3 operators. 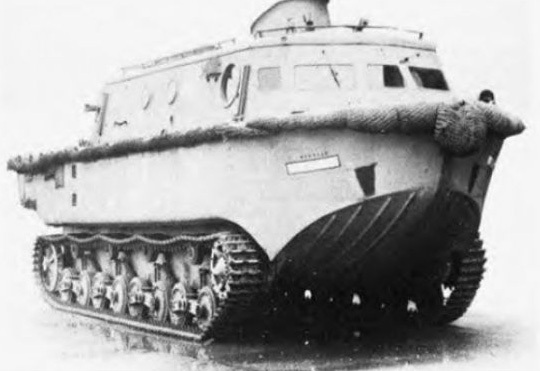 It was the early development efforts for a more effective amphibious landing craft capable of traversing difficult terrain and able to make significant inland maneuvers. Capable of sea launches to transport onto land as well as cross rivers and other water barriers to land access. Second iteration opf the concept -- the Panzerfahre Gepanzerte Landwasserschleppen 2 -- more closely resembles modern landing craft. This example has startling similarity to the modern US efforts as described here. 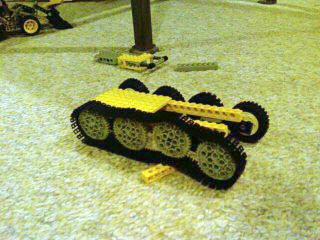 Looks like a similar construction to this one but with larger and more aggressive treads and aesthetic design. 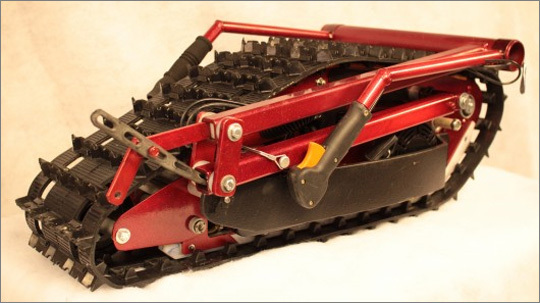 A company called Evatech makes and sells some pretty fancy tracked lawnmowers for industrial applications. 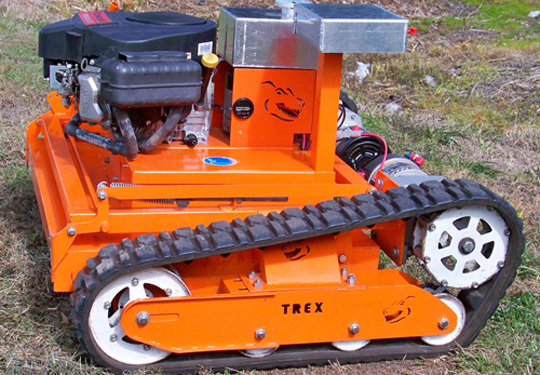 They're intended for mowing on steep slopes, low overhead access, and anywhere too dangerous for a human operator. The models have a gas powered lawnmower blade drive and an electric drive for the tracks. Looks to me like they're using some simple off-the-shelf drive components from electric mobility scooters, some readily available industrial rubber tracks, R/C controllers, and lawnmower machinery. 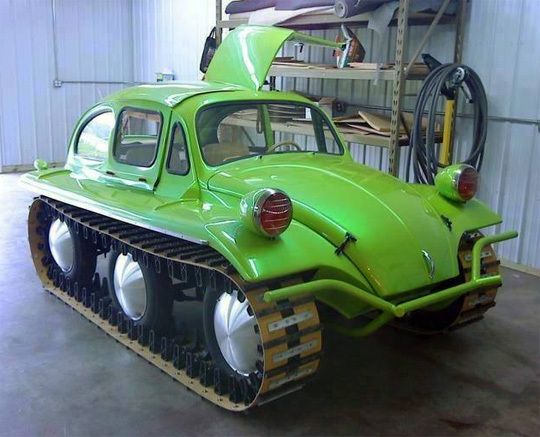 I like the ingenuity of design and the build looks robust. Their drive sprocket, for example, appears to be an elegant build solution: bolts with sleeves positioned around the circumference of a round metal plate. Simple and effective. Curious to know how intensive they are to operate by remote control. 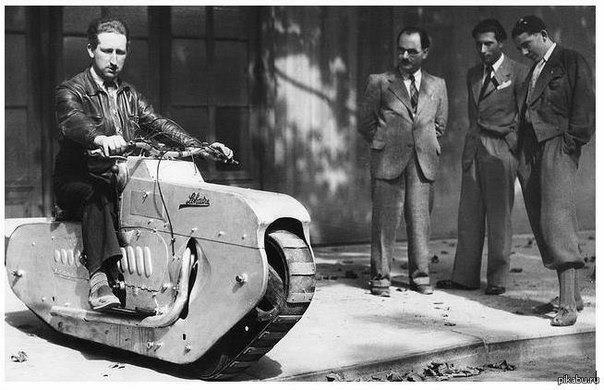 I present the 1939 Lehaitre tracked motorcycle. 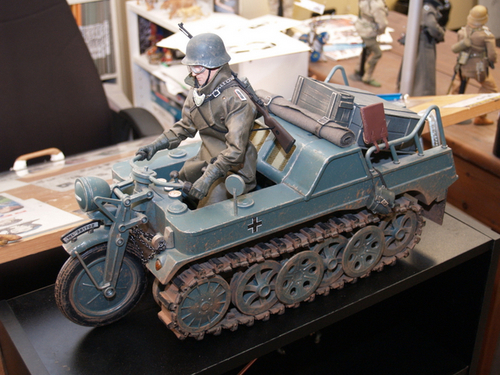 WWII made engineers see tanks and tracked vehicles everywhere, and apparently this enthusiasm spilled over to the world of motorcycles. 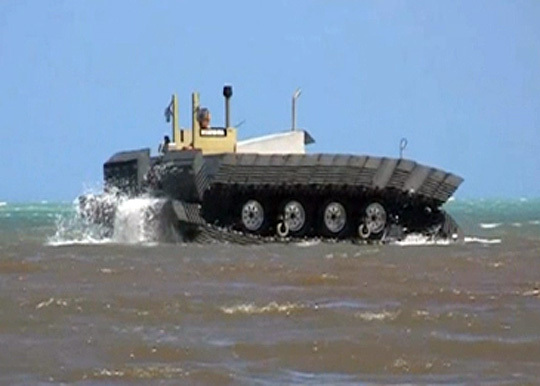 DARPA funded the development of this tracked vehicle -- Captive Air Amphibious Transporter (CAAT) -- which is part paddle wheeler and part tank. 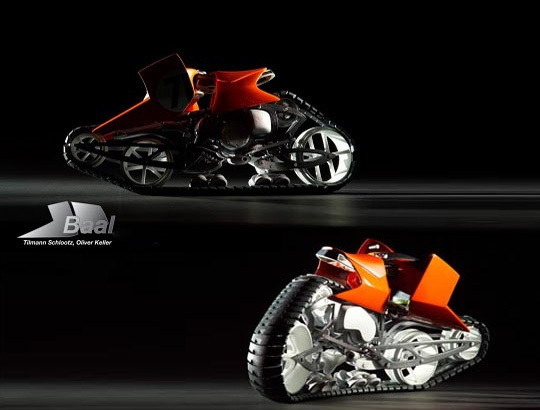 Designed to be an autonomous transport vehicle in land and water, this vehicle seems to take the best qualities of the track tread and make it work in these two environments. Now, I know this is cool and all, but it is also a patent fake, 'shopped', a photoshop composite image. 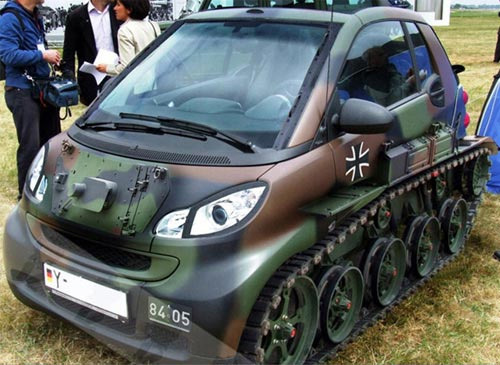 This image of a 'Tracked Urban Mobility Scout" or TUMS appears to be someone's imagination exploring the idea of fitting a Mercedes Smart car with a German Military Weasel light tank. 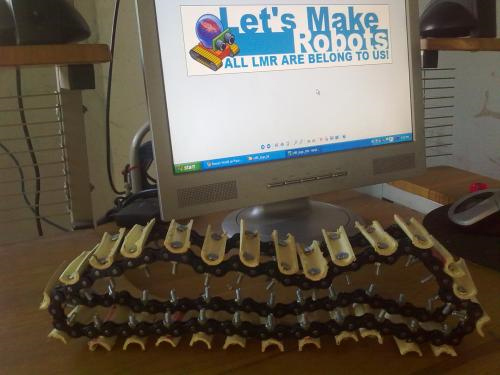 A visitor to the site -- t00tie -- sent over a link to a very cool 3D printer model for plastic tracks. The model is called "Moon Rover" created by emmett on the site Thingiverse. 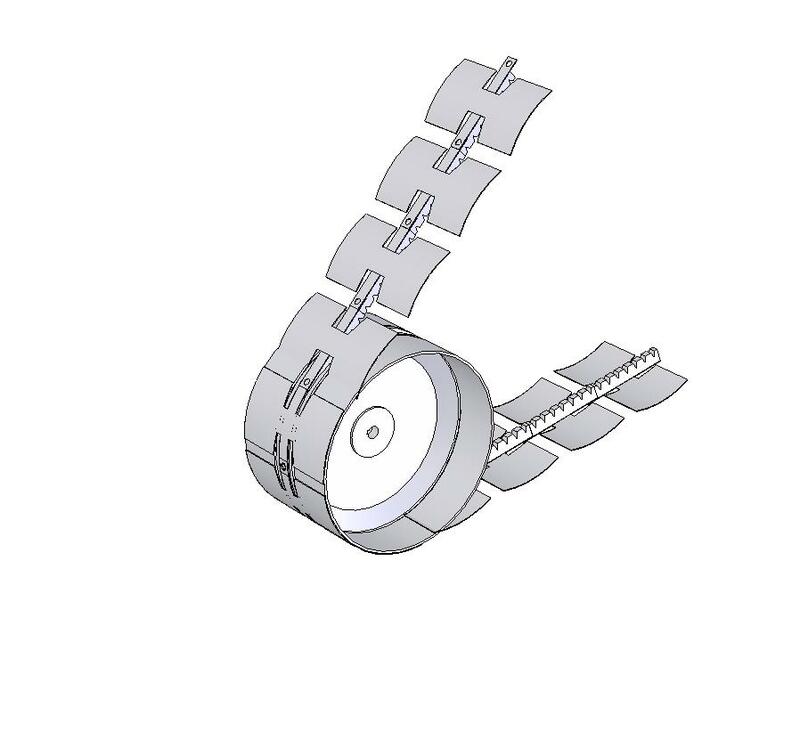 The track design is derived originally from a expanding bracelet and it utilizes the pliability of ABS with the natural flex of the deep inset hinges between each cleat to get a simple yet effective tread. 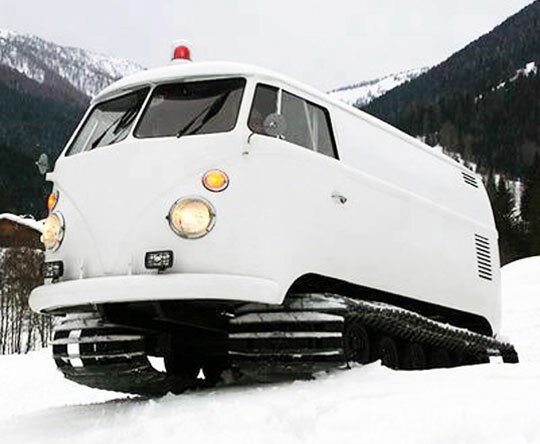 There have been a number of tracked recreation vehicle designs popping up lately pushing into an interesting area of hybrid conversions. 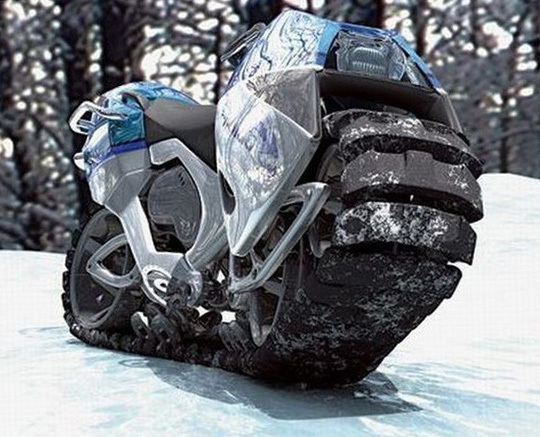 Specifically, these are kits designed to convert an off-road motorcycle into a uniquely capable snow machine. 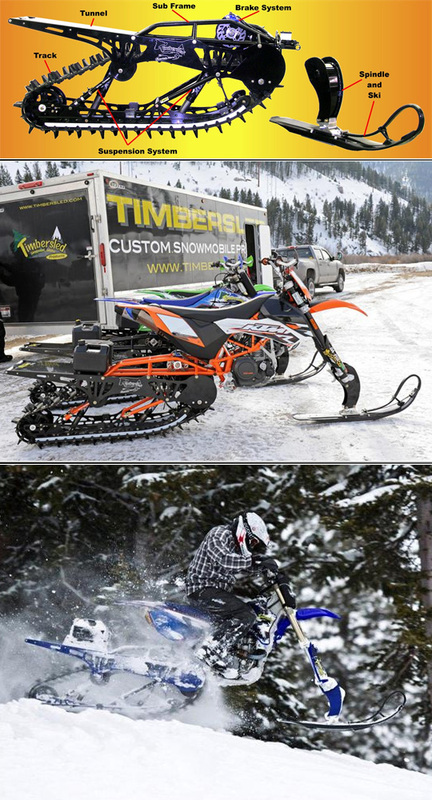 There are many companies, however, Timbersled is a popular kit out here in the mountainous West Coast of Canada. 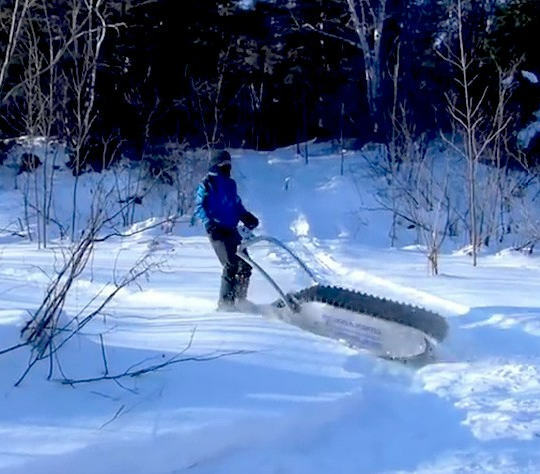 Just stumbled upon this site about two guys, Tim Park and Jim Maidment, from Kimberly BC Canada who made a tracked vehicle they call the Skizee. Intended for ski patrol and back country skiiers to gain additional mobility and range in their activities. 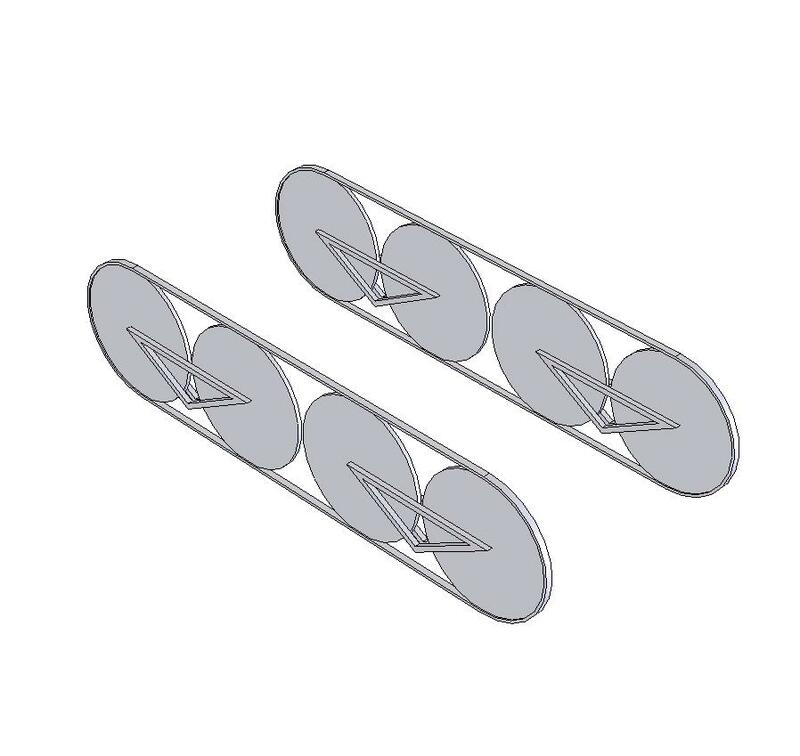 As part of our brainstorming session, Greg and I discussed the possibility of a single tracked bicycle design where the track could flex into an arc for the purposes of cornering. Turns out, a couple of crafty German designers, Tilmann Schlootz and Oliver Keller, thought of this long ago and in 2006 released a motorcycle model for the Michelin Challenge Design competition. We have found an old 3 wheeled golf cart and rebuilt all the required parts to make it a reliable machine for this year's Burningman event. 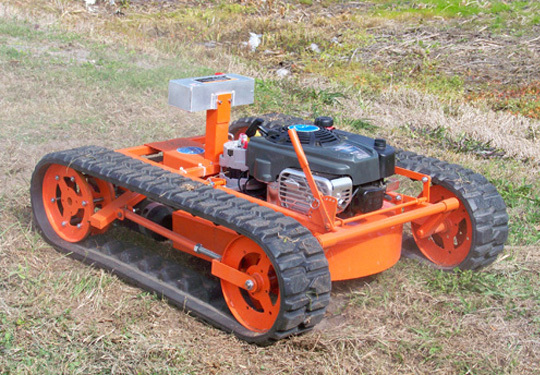 This platform has a good gas motor, large electric starter/generator, and solid variable speed transmission. Next year, we plan to remove the rear wheels, extend the back, and add tracks. It's hard to look too serious while riding a 3 wheel golf cart with red fun fir seats . . . 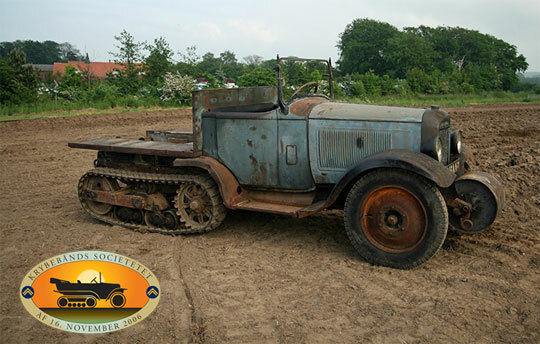 Given the constraints of managing steering and traction, Dave and I have settled on a tracked tricycle design similar to that used in WW2. Found some smaller ATV track examples. Similar to the car previously posted, however, smaller. 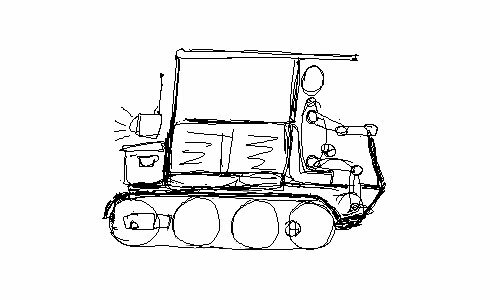 One attractive thing about this design from a human powered vehicle perspective is that we would no longer need to utilize the skid-steer method of turning, which is inefficient and difficult for a load capable track design. Conversion kits are promoted as excellent for snow, mud, and sand use, and depending on the track, also good on hard surfaces. 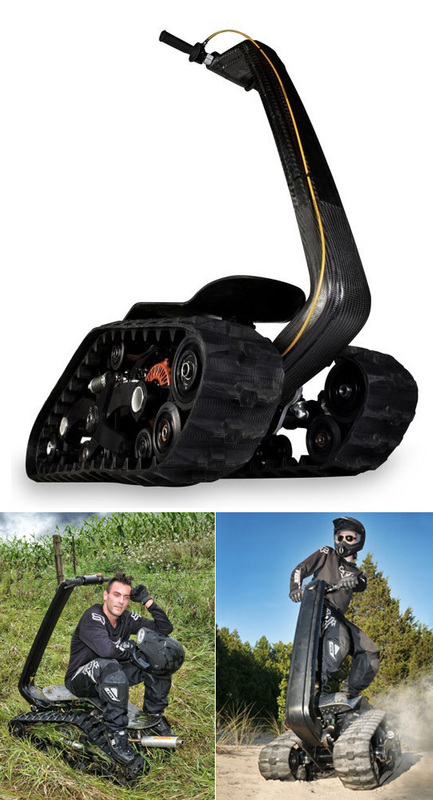 They offer improved traction in soft terrain because they spread the weight of the rider and vehicle over a large contact area to prevent sinking into the terrain. Notice the front tracks tend to be shorter and center the weight over a smaller area under the main cog (where the tire used to be) in order to improve handling and allow easier turning effort. The rear tracks tend to be long and flat for maximum traction and cargo capacity. The Litefoot Track includes internal suspension and pivot arms to provide additional flexibility. 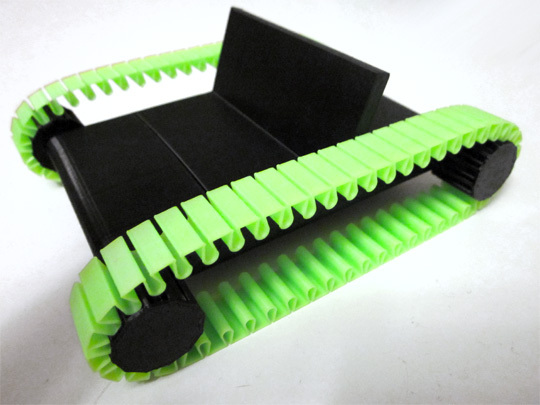 Found a belt on the McMaster-Carr website that may serve as a good rubber track for the project. This video shows a modern all-wheel drive car fitted with custom tracks. The interesting thing for us is the design of these tracks: The 4 wheels at the bottom contact patch, all connected by pivoting arms that allow the track to follow the ground. This is very similar to the design we created out of lego. Also, the use of a rubber track in this application is parallel to our own plans. Notice the cab-forward position of the driver(s) who also pedal the vehicle. The mid section is two doubleseat benches positioned sideways for the passengers (tentative seating plan) and a gear section to the rear where the sketch shows a cooler and radio. Dave Montie and Greg Montie's 8 wheeled ground following track concept. Each of the 8 wheels will be bicycle rims and each set of two wheels is joined by arms that themselves pivot to follow the irregularities of the terrain.